Last week at PAX Dev, former Motion Twin marketing manager and head of studio Steve Filby talked about the marketing strategy behind the company's hit Dead Cells. There's no coverage of the talk as PAX Dev is a "black box event" closed to the press, but Filby agreed to speak with GamesIndustry.biz this week about the subject in a manner more fit for public consumption. 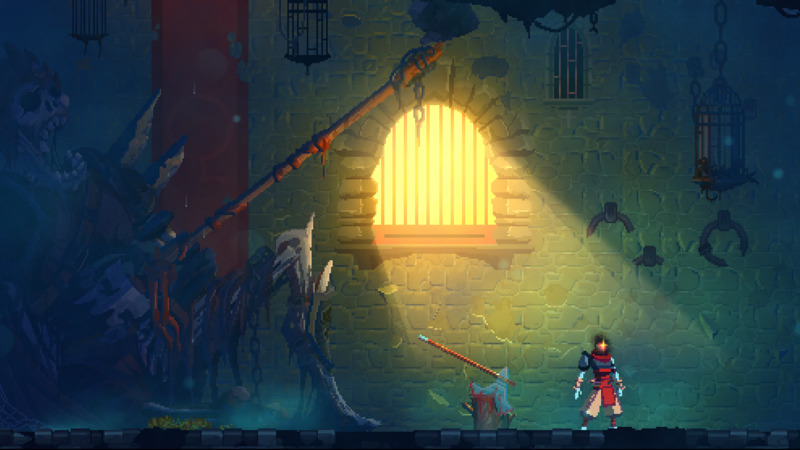 Originally, Dead Cells was a tower defense game split into a building-and-placement phase combined with an action-platformer phase. Filby had done his due diligence on the marketing side, scouting out the competition on Steam, looking to find common traits among the genre leaders and pain points where Motion Twin could offer its own improvements. Then he left for one weekend. "When I got back, they had completely axed the tower defense and gone whole-heartedly into the Metroidvania action-platformer thing. So yeah, that was a bit of a surprise," he deadpanned. "When marketing in video games, you're always doing things reactively. You're always reacting to the creatives, and trying to make sure they understand the implications of what they're doing. So obviously, I was like, 'Are you friggin' kidding me?' I was tearing my hair out." Filby had to reassess the game in light of its new placement at the increasingly crowded intersection of roguelikes and 2D action platformers. After examining the strengths and weaknesses of the biggest and best competitors, the studio decided to focus on a few key aspects: combat, movement, and item balancing. "Most people are going to try and get the biggest streamers they can, and that includes spending money on them. So we did the opposite"
With the game's new direction set, it was up to Filby to get the word out about it, with a strategy that relied on three separate yet interdependent efforts: one for streamers and influencers, one for the press, and one at events. "Basically the strategy with the streamers was to do the opposite of what most people do," Filby said. "Most people are going to try and get the biggest streamers they can, and that includes spending money on them. So we did the opposite." Streamer culture is very much an echo chamber, Filby said, with streamers of all sizes keeping a close eye on their peers. So instead of paying up to $30,000 an hour for a top-tier streamer to play Dead Cells, Motion Twin started by giving demo access to smaller streamers, believing they were being watched by slightly larger streamers, who were in turn watched by larger streamers, and so on. "We started off with streamers with 0-5 concurrent [viewers], then 5-25 concurrents, then 25-to-100, 100-to-1,000, and that happened progressively over three months with the demo version," Filby said. "And about two or three weeks before launch, we were pitching the full version of the game to all the top-tier YouTube and Twitch guys with an embargo... By the time those tier 1 and tier 2 [influencers] were playing it, they'd already seen the guys we'd hit previously playing the demo, and a lot had sent us code requests." That effort culminated in the game's initial launch into Early Access in May of 2017, boosted by the first wave of reviews in the enthusiast press, particularly a 9 out of 10 score from Polygon. Filby said that helped push the game over the top and land free coverage from some of those top-tier streamers who would have otherwise required generous compensation for their time. "Because we had the press and we'd already a good base of influencers watching, all the rest of the top-tier guys really just couldn't ignore the game," Filby said. "When we look at where our traffic is coming from, it's definitely not coming from any of the press websites"
While press coverage for the game can be key to a game's success, Filby said it's not about directly generating sales. "When we look at where our traffic is coming from, it's definitely not coming from any of the press websites," Filby said. "So it's really just about getting the attention of key people in the industry, and also your early adopters. They're basically the people who are going to buy this game on the first day, and test it out and write a review. Those guys are avid press readers." Press coverage from major outlets gives a game legitimacy in people's eyes, Filby said. It increases awareness of a game among potential customers. It convinces large streamers that a game is worth their time. It puts developers on the radar of platform holders, which can also be crucial for a game's success. So if press coverage makes a game legitimate to everyone else, how does a game become legitimate to the press? "That's the hard part," Filby admitted. "This is where the events strategy comes in." The first part of that strategy actually happens before a game begins the events circuit at all. Filby's first order of business was to follow as much of the gaming press as possible on social media, suss out where they get their information from, and then make sure Dead Cells was there. Some websites and development communities have a reputation for being a good place to find indie gems, but Filby also said plenty of journalists keep tabs on social media hashtags like #gamedev and #indiedev. "Stink up those parts of the internet basically so that hopefully by the time you start showing at events, people might have seen a .gif or they might have heard of the game," Filby said. That sort of effort not only helps with generating interest from the press, but can also help land a game in the Indie Megabooth or at the MIX (Media Indie Exchange), two platforms that happen at E3, GDC, and a handful of other events throughout the year that Filby said increase a game's legitimacy and convey a good first impression. Events were a costly proposition for Motion Twin, as travel costs from the Bordeaux, France-based studio and unanticipated show-related expenses had a habit of piling up. They did a number of smaller European shows, and tried to take advantage of those few shows each year where the world's entire gaming press is represented in a single room. In total, Filby said Motion Twin spent about $150,000 on pre-launch marketing, with $90,000 of that simply being employees' time as they did the legwork associated with a proper campaign. "Pretty much the entirety" of the remaining $60,000 was spent on events. It was a considerable amount for the studio, but Filby said it was ultimately worth it. After all, it helped land key sit-down meetings with Microsoft, Sony, Nintendo, and Valve. "You just can't underestimate the importance of those kind of things," he stressed. "Valve are very hands-off; their store's pretty much algorithmically driven. But at the same time, if they're watching your game and it's almost there and doing well, they can sort of give you a bit of a hand." "Prevailing wisdom is that you only get one launch... So obviously doing 100,000+ copies in our first week of Early Access, people were like, 'Well you had your launch'"
The cost of appearing at events can also be mitigated by a bit of merchandise. Filby said developers can have T-shirts of their game made and shipped directly to an event like PAX West where they can sell them at the stand. Filby expects to experiment with that practice in the future after talking with a number of developers who were doing it at the show this year. The above approach helped make Dead Cells a hit when it launched. And even internally at Motion Twin, people were managing expectations about just how much room there was for the game to grow its sales. "Prevailing wisdom is that you only get one launch," Filby said. "You either get your Early Access launch or you get your Leaving Early Access launch. So obviously doing 100,000+ copies in our first week of Early Access, people were like, 'Well you had your launch.' You've done your dash, basically." Even so, Motion Twin wanted to make the most of the game's full launch and console debut, which took place last month. So the studio reached out to the streamers it already had close ties to and asked what they wanted out of games. The answer came back that they wanted new ways to engage with their communities, and anything that would help foster that community feel for the people in their chat. To that end, Motion Twin added Twitch integration features in the game, so people streaming Dead Cells on the site could allow their viewers to affect the game experience, perhaps healing the player or making their lives harder by swamping a level with additional enemies. The studio also gave streamers a set number of keys to distribute to fans each week, promising more the following week if they streamed Dead Cells for a set amount of time. Filby described build up to the game's second launch (its exit from Early Access and release on consoles) to have the biggest possible impact. There was the Twitch integration news, the console announcement, the release date announcement, physical editions, and finally, an animated trailer that wound up being the single biggest marketing spend for Dead Cells, but also "paid dividends in ways I don't think we've fully understood yet," Filby said. It was all part of a calculated, coordinated global strategy to maximize awareness and anticipation around the second launch. "Keep reminding people you're there," he said. "Keep staying on top of mindshare. So when the animated trailer goes out and the exclusive access unlocks for the Twitch integration and the final version of the game, everybody's there. They're already waiting and beating down your door, basically." A month before the second launch, Dead Cells was sitting at a cumulative 181 million minutes watched on Twitch over its lifetime. A couple weeks after the second launch, that had spiked to 325 million minutes. While Filby worked on Dead Cells throughout this process, he left Motion Twin to launch his own marketing agency IndieCatapult partway through. At the risk of self-promotion, Filby said his takeaway for developers is to have full-time marketing people working on their games, and to think strategically about every aspect of the communication and development process. "A lot of your marketing is purely in strategy and how you do things," Filby said. "Having these vague ideas for people who don't have the time or expertise in which day of the week to launch, how to do it and that kind of stuff, it won't necessarily translate into a coherent strategy that makes sense... Sit down and spend the time to plan everything out really carefully, and then execute."